Is Your Turkey Organic/Humane/Conventional/Too Big? It seems like fretting over the kind of turkey on the table is becoming a new Thanksgiving tradition. There is certainly an air of my-turkey-is-better-than-yours creeping into daily chats at the bus stop; based, not on the crispiness of the skin, the moistness of the meat or the flavor of the glaze but on how the turkey was raised. A flippant reaction this is, of course, that no matter how humane the raising, if the objective is killing and eating then the superiority sort of loses steam. But let’s get serious and see why we should pay what seems to be a really high price for an organic turkey: while “conventional” turkeys cost about a dollar a pound at regular grocery stores; heritage, free range, organic turkeys cost almost four times as much per pound. Organic here relates to the feed and organic feed costs more, the processing of the organic turkey also costs more. Organic producers may lose more birds to disease as they are limited in the methods to cope with sickness so that adds to the cost as well. The cost of turkeys that are not confined is higher also because they can contract more diseases from being outdoors. “Conventional” is generally supposed to convey that the turkey was raised on regular feed and the feed may consist of GMO corn. Being less expensive, the customer gets more for his dollar and is able to put as huge a turkey at the center of the meal as he/she likes. 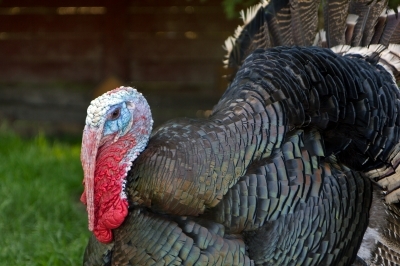 And that bring us to the “too big” issue: why are turkeys so huge? the answer lies in consumer demand. The most commonly bred turkey, called the broad breast white, is popular because consumers want big portions of lean white , breast meat instead of dark so turkeys have been bred (conventionally, there are no GMO turkeys) to meet that demand. The disproportionately large breasts also means that they cannot breed naturally and must be artificially inseminated. Now that we have this information, how will this impact what we buy? One, perhaps some might stop eating turkeys altogether if the process of bringing them to the table causes discomfort. Second, for many among us, the organic version just will not fit the budget so it helps to have alternatives so the two markets might coexist for a while. Third, if you want a turkey, then using the whole turkey instead of only a certain portion is a better option, and a better use of the resources needed to raise turkeys. No matter what we choose, we are thankful to have choices and not be in the grim circumstances that preceded the very first Thanksgiving dinner. This entry was posted in Food Choices, Food Security, Hunger, Living and tagged food decisions, food security, Hunger, Living. Bookmark the permalink.